Do I Have to Have Hammertoe Surgery? Summer is in full swing and sandals are the shoe of choice, but if you’re self-conscious about your hammertoes being on display, not to worry -- you don’t have to resort to the fashion faux pas of wearing socks with sandals, and you don’t necessarily have to resort to surgery, either! There are things you can do to help your curled toes straighten. Stretches can be done and splints can be worn to keep hammertoes flexible and help them stay flat. Shoes that offer plenty of wiggle room help too – like those open-toed sandals of yours! (Visit The Right Shoe for all sorts of fabulous footwear options to meet your needs!) If these measures don’t seem to be helping, though, and you’re noticing it’s getting harder and harder to straighten your toe, it might very well be time to consider hammertoe surgery after all. 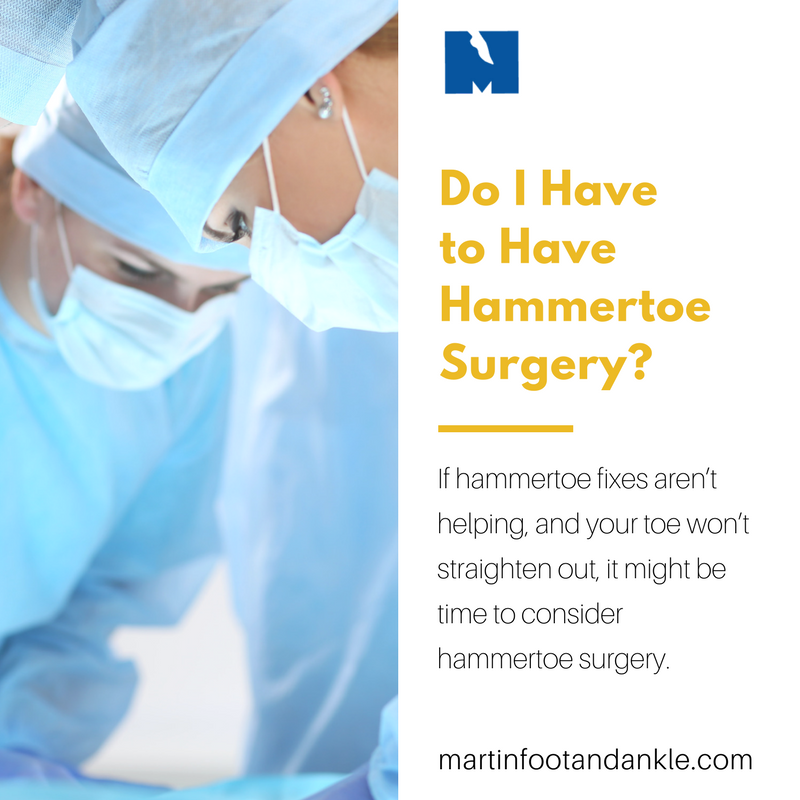 The good news is that surgical procedures for hammertoes are done on an outpatient basis and are typically not very complicated, so it doesn’t take long and you’re home the same day! Recovery is fairly quick as well, usually lasting just a few weeks. The type of hammertoe surgery you’ll need depends on the severity of your condition. If your toe still has some flexibility, a tendon transfer may be all that is necessary. With this procedure, the tendon in your toe is rerouted from top to bottom so that it pulls your joint down and straightens the toe. If your toe has become rigid, however, a joint resection procedure will likely need to be done. This process entails a small incision made at the top of the toe to cut and shorten the end of the bone and surrounding tendons and ligaments, thus forcing the bent joint straight. In serious cases that are causing chronic pain, the bones making up the joint may both need to be cut then fused together in proper position. Regardless of the particular procedure you undergo, you can expect some swelling and discomfort for a time, but just think, before you know it, you’ll be wearing those sandals without worry (not to mention, without socks)! For help with hammertoes or more information on hammertoe surgery or The Right Shoe store, give us a call at (717) 757-3537 to make an appointment at any of our PA offices. Find out how you can curtail that curly toe today!